Pages formatted for MS Explorer Only: Shifted Text Will Result Otherwise! 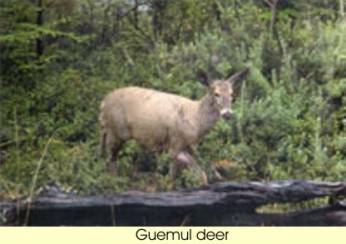 Introduction to it's topography, flora and fauna. Major Ancient Cultures, Cities, and Areas of Habitation are indicated on this Map. The outsider visiting the Andes perceives two overwhelming geographic realities: the Pacific coastal desert stretching for thousands of miles from Peru to Chile and the high Andes mountains rising parallel to the coast. 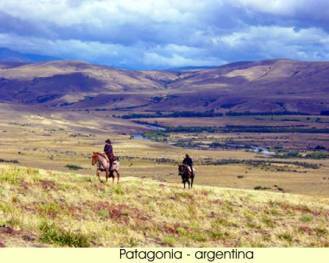 These contrasting regions—utter desert on the coast and the high, looming mountains to the east (where the bulk of the pre-Columbian population lived at above 10,000 feet). These people could, and at several times in Andean history did, coalesce into a single political entity. 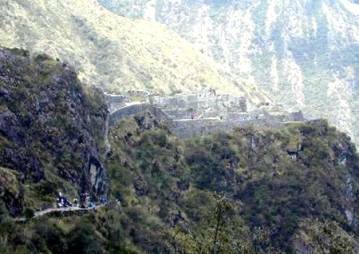 Thus it is possible to speak of a single Andean civilization, even if at times, early and late, there was no political integration. One indicator of this social unity exists even now: Quechua, one of the Andean languages, is still spoken by some 10,000,000 people from northern Ecuador to northern Argentina, a distance of several thousand miles. 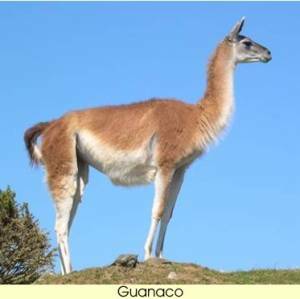 The Andes consist of a vast series of extremely high plateaus surmounted by even higher peaks that form an unbroken rampart over a distance of some 5,500 miles—from the southern tip of South America to the continent's northernmost coast on the Caribbean. 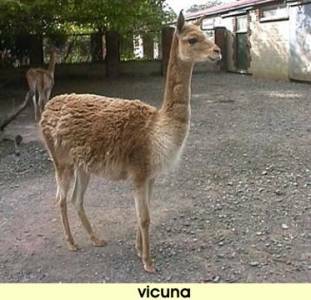 They separate a narrow western coastal area from the rest of the continent, affecting deeply the conditions of life within the ranges themselves and in surrounding areas. 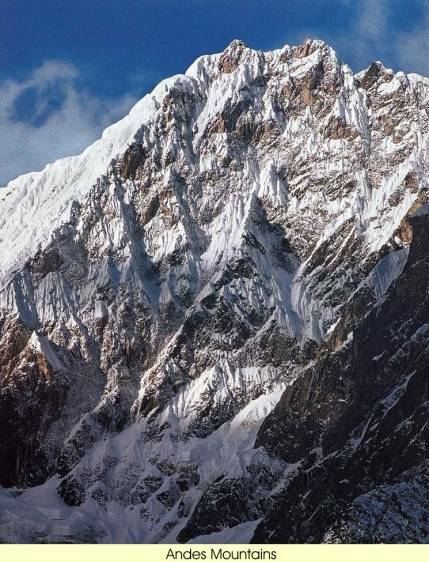 The Andes contain the highest peaks in the Western Hemisphere. 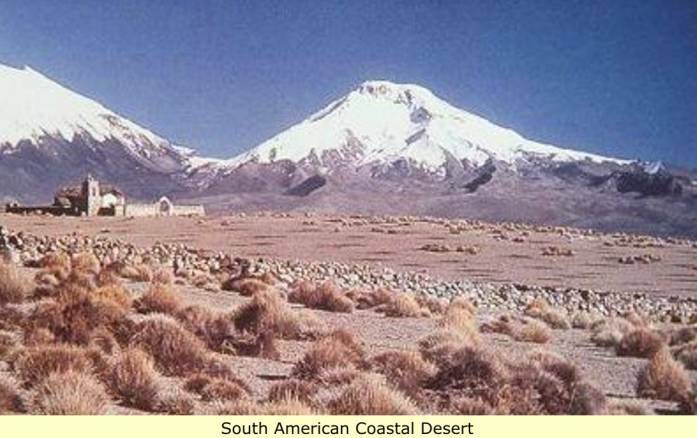 The highest of them is Mount Aconcagua (22,831 feet) on the border of Argentina and Chile. These mountains block rain producing clouds coming from the east, thus – the eastern side of the mountains is very wet and the western side of the mountain range is very dry. 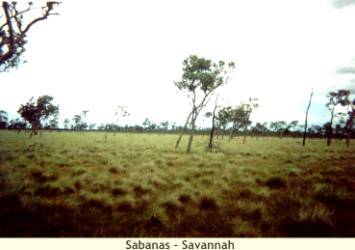 On the western side of the range, often the only moisture available for the little plant and animal life that exists, is condensation from the very thick fogs that form. 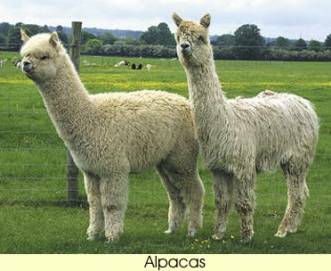 The ability of animals and plants (the Fauna and Flora) to live in the Andes depends largely on altitude, although the existence of plant communities is also determined by climate, availability of moisture, and soil. 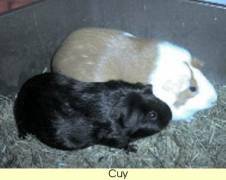 The existence of animal life is determined by the abundance of food sources; the permanent snow line is therefore the upper limit of habitation. 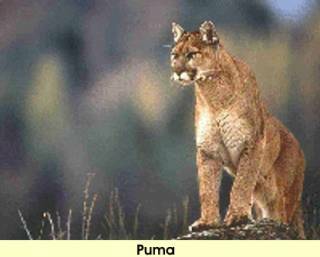 Some plants and animals can live at any altitude, and others can live only at certain levels. Cats rarely live above 13,000 feet, whereas white-tailed mice usually do not stay lower than 13,000 feet and can live up to 17,000 feet. 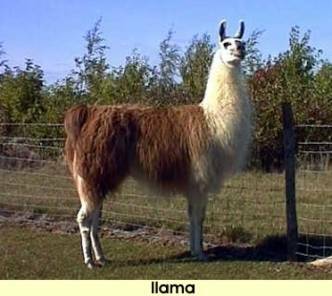 The camelids (llama, guanaco, alpaca, and vicuña) are animals primarily of the Altiplano (aka. 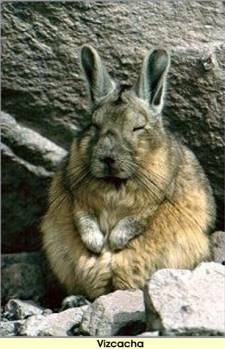 the Puna – the high Plataues - 11,200 to 12,800 feet), although they can live well at lower altitudes. 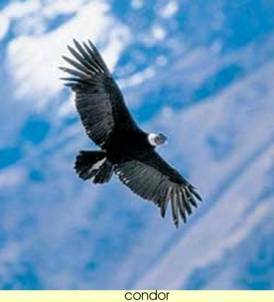 It is thought that the condor can fly up to 26,000 feet. 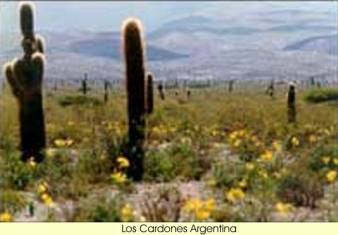 Probably the low atmospheric pressures of high altitudes are less important for vegetation, but altitude does impose a number of climatic variables—such as temperature, wind, sun radiation, and dryness—which determines what kinds of plants grow in different parts of the Andes. In general, the Andes can be divided into altitudinal bands, each with typical predominant flora and fauna; Of course latitude (closeness to the Equator) imposes differences between north and south, and proximity to the Pacific and to the Amazon basin on the east is reflected in differences between the external and internal slopes of the Cordilleras Occidental and Cordilleras Oriental. 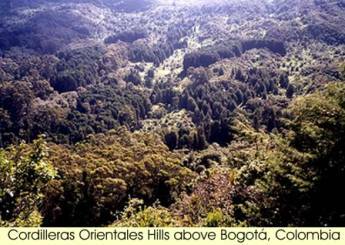 (A Cordilleras is a system of mountain ranges with parallel chains - Occidental = west, Oriental = east.) 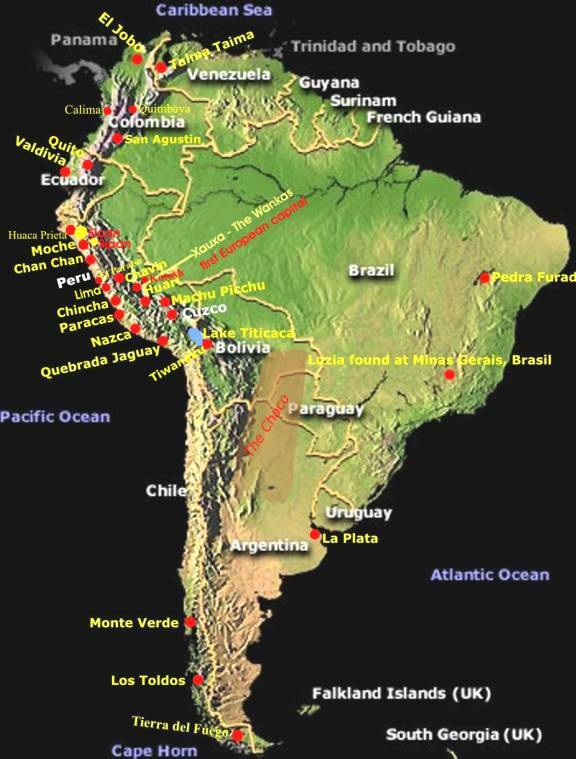 The South American Cordilleras extends from Colombia to Bolivia. A zone at about latitude 35 degrees south separates two different regions of the Andes. 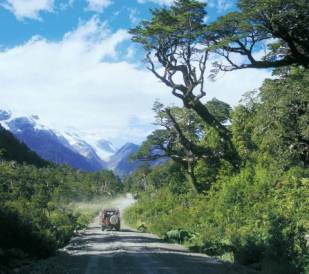 To the south, in the Patagonian Andes, the flora is magnificent mid-latitude rain forests of the conifers; Araucaria and oak, coigue (an evergreen used for thatching), chusquea, cypress, and larch are also found. Characteristics to the north are different. 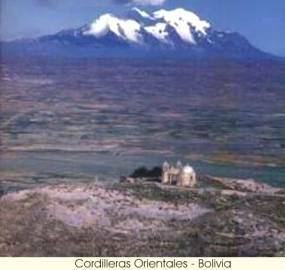 The Cordillera Occidental (the westernmost of the two in Bolivia, extends generally north south for about 750 miles through the length of the country. 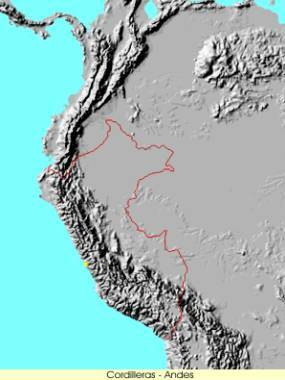 The Cordillera Real (west) separates the lowlands of the Amazon River basin to the east from the high plateaus of the Altiplano to the west). It is extremely dry in the south, slightly humid (with moisture and scarce rainfall) in central and northern Peru, and humid with heavy or moderate rainfall in Ecuador and Colombia. 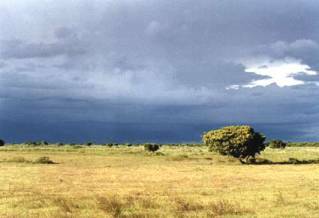 Vegetation follows the climatic scheme: in the south it is poor and desert-like, though at higher altitudes steppe vegetation occurs. 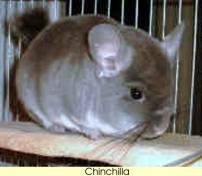 Animals include the guemul, puma, vizcacha, cuy (guinea pig), chinchilla, camelids, mice, and lizards; among the birds are the condor, partridge, parina, huallata, and coot. Agricultural potential is poor. The east side of the Cordilleras Oriental (east) northward from Bolivia has lush vegetation, most of it tropical forest with a rich jungle fauna. On the plateau (valleys, plains, ranges, and internal slopes of the cordilleras), life again is closely related to altitude. Tropical palms and eternal snows lie within a few miles of each other, where altitude may vary from 1,600 feet in deep gorges to more than 20,000 feet in peaks and ridges. 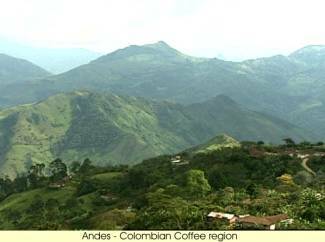 Up to an elevation of 8,000 feet, vegetation reflects the dry tropical and subtropical climate, here agriculture is important: the great coffee industry of Colombia is located mainly in the warm valleys of this zone. 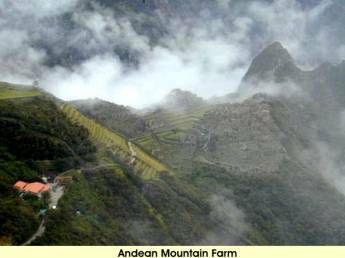 Between 8,200 and 11,500 feet lies the most populated zone of the Andes; some of the major cities of the Andean countries are there, and the zone supports the main part of Andean agriculture. Temperatures vary from warm in the valleys to moderate low (down to 50 - F) on the plains, sabanas, and slopes, and there is seasonal rainfall and water from rivers. This zone also is suitable for livestock and poultry farming. 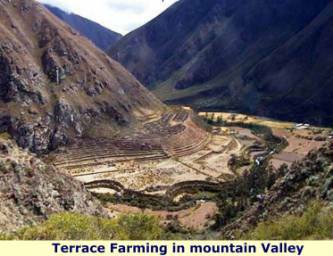 Between 11,500 and 13,400 feet terrain is usually rough and difficult for agriculture. In Colombia this zone is called páramo and sub-páramo, with seasonal rainfall; in Ecuador rain is abundant; and in Peru and Bolivia the páramo has from moderate to scarce rainfall. 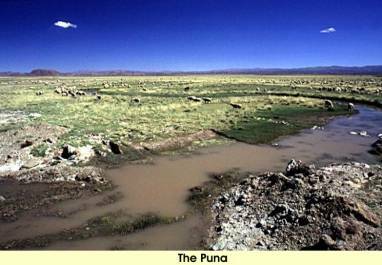 From 13,400 to 15,700 feet (the puna), vegetation consists of plants that resist the cold temperature and nighttime freezing; above 16,000 feet, vegetation is almost absent.